Beth was kind enough to share her thoughts about the development of the recent Why We Work exhibition with ExhibiTricks readers. In my job at the Baltimore Museum of Industry, I look for ways to build visitor interaction and engagement. As an instructor with the Johns Hopkins University Program in Museums and Society, I teach courses that bring students into museum work. During the fall of 2017, I embarked on what seemed like an ambitious but straightforward plan – to teach a class about interactive spaces and then, with generous funding from the Andrew W. Mellon Foundation, create a temporary exhibition at the museum reflecting students’ vision and ideas. I had very few parameters to work with - an empty gallery space, a timeline, and faith that the semester would yield something compelling. This simple plan quickly got complicated but in the end, resulted in a project I could never have imagined. Because my students were not all familiar with museum work and none of them were historians, we started the semester with a series of readings and discussions about exhibition design, visitor studies, and museums. And we purposefully explored the question of what elements support engaging, relevant and successful interactive spaces. Starting the design process in the classroom meant that we had the luxury to revisit our own experiences, explore case studies, blogs, research and advice from guest speakers - Gamynne Guillotte from the Baltimore Museum of Art, Andrea Jones of Peak Experience Lab and Mike Murawski from the Portland Art Museum. We actively defined our classroom as a lab space for thinking through possibilities, as well as different and new perspectives on process and approach. For my own part, as an instructor, maintaining this mindset cultivated transparency and heightened self-awareness about the work ahead. After considering examples from outside the museum, students dove into content in the museum’s galleries and archives. Their research and conversations inspired them to focus an abstract idea for this exhibition — What is the experience of work? What motivates us at work? What makes for satisfying work? How could we tie the museum’s larger focus on industry to visitors’ personal experience of industry (or work)? To do this, my students committed to centering visitor participation as the key element for the space — who better than visitors to share what contemporary work experience looks like? While I expected students to lean into the personal stories of work and visitor participation, they pushed things in a deeper direction than I’d initially been imagining. Letting go and giving students the space to develop what they wanted to see meant I had to work consciously and consistently to listen and work along-side them rather than pushing them in one direction or another. I found myself describing the process as “soupy” – now I see that it was also collaborative, substantive, iterative, authentic and in a true sense educational not just for my students, but for me. 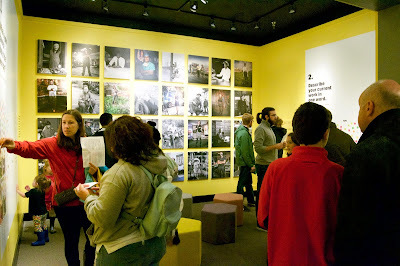 Once big ideas were solid enough, we brought them out of the classroom and shared them with visitors in the museum. Ideas and questions that led to the most discussion with visitors eventually made it into the exhibition text – What is your favorite time of the workday? If you could describe your work in one word, what would it be? What motivates you at work – compensation, community, acknowledgment? We knew we needed an excellent design to inspire these kinds of conversations in an exhibition space not staffed by students. What kind of interactive would do the best job? Expanding our exhibition team even more, we invited Jeremy Hoffman and his Maryland Institute College of Art students to take my students’ content, ideas and goals for the space and develop exhibition designs. Nine different design lenses were shared – each one offering an interpretation of what might be possible for the space. Seeing their ideas reflected in so many different possibilities prompted my students to lean into and fine tune their curatorial vision. They were particularly drawn to two ideas offered by the design students: One that centered the personal via a portrait wall of contemporary and historic photographs of people working in Baltimore. And another that centered visitor interaction by inviting them to respond to a prompt on the wall, “leaving their mark” and creating something collectively over time. Students ended the semester with a “blueprint” for Jeremy (Ashton Design) and myself to use as we made the exhibition space a reality. In order to make the portrait wall a reality, Jeremy contacted local photographer Christopher Myers who generously let us into his archive of contemporary portraits of Baltimoreans at work. Working with museum staff, volunteers and my students, we also sourced historic images of workers in Baltimore from the museum’s collection, the Library of Congress, personal connections and the images of A. Aubrey Bodine. Over the course of several weeks, and through much discussion and feedback from students, museum staff, and volunteers, we narrowed down our portrait wall to 32 images. The rest of the exhibition space is populated with large questions inspired directly from the visitor testing students did and readings about contemporary work experience. The interactive asks visitors to take a sticker sheet from a category they feel best describes their work. Then they use three dots on that color-coded sticker sheet to plot their answers on the wall. If you imagine each sticker dot as a data point, together all these dots become a picture of contemporary work on the walls of the exhibition. Since we’ve opened this show, the space has become a favorite with visitors to the museum. They linger, engage in the activity, take in the portrait wall and even talk with each other about the data on the walls and their own experiences of work. I truly believe that the success of this exhibition is in part due to its genesis. Born out of a semester of study, this exhibition involved successively wider circles of dynamic curatorial, audience, collegial and design engagement – first in the classroom at Johns Hopkins University, then with staff and visitors at the Baltimore Museum of Industry, then collaboration with students at Maryland Institute College of Art and finally, with visitors as their engagement literally changes what is on the walls in the exhibition. Though it’s harder work, getting more people involved, ruminating and revisiting ideas, testing and refining, letting go, and centering multiple perspectives can only make the final product stronger. For me, this process was a reminder that opening up, being flexible and listening can yield creative and collaborative end results that we can’t even imagine at the start. And, for me, this process also helps answer the question of why we work. It’s hard to describe an interactive exhibition in a written description. Check out this radio interview about the project or better yet come to the museum! Why We Work is up through April 2019.